ShakespeareGeek.com is Dead. Long Live ShakespeareGeek.com! Hello, world! If you’re seeing this, that means I’ve gone ahead and pulled a trigger that I’ve had my finger on for several years now. When I started ShakespeareGeek.com back in 2005, I used the free service known as “Blogger”. If anybody’s been around with me that long you might even remember that the original name was “Such Shakespeare Stuff” and we lived at http://suchshakespearestuff.blogspot.com. Fast forward 10 years and almost 3000 posts and it had gotten a little cramped. The rules for what makes up a good web experience changed on us, and I found it frequently hard to keep up. Which, in turn, made it more effort for me to put out the content I wanted to at the level I wanted. Which ultimately resulted in less content, which made me sad, and the downward spiral would continue. But on the flip side we had lots of people linking to us, and for some queries ShakespeareGeek.com is on the first page of Google results, and that is not something you just walk away from! So I’ve agonized over the decision for a long long time about when to switch from Blogger to WordPress. I didn’t know what would break, or how much effort would be required to fix it. That’s like saying I can’t ever move to a new house because some dishes might break, or I’ll forget which box holds my spare phone charger. Sometimes you just had to make it happen. And here we are! Thank you all for taking the ride with me for so long. It seems like only yesterday I started the site because I had no one to talk to about Shakespeare, and wanted to light a little candle and see how far it might throw its beams. And just look at us now. There’s over ten thousand people watching on Twitter and Facebook for this site alone, and many of them are running their own little corners of the Shakespeareverse. Talk amongst yourselves, make some friends. I bet you have a lot in common :)! Who knows where we’ll all be ten plus years from now? 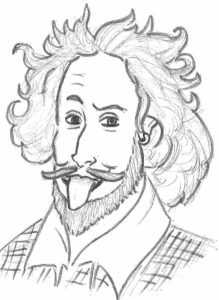 So once again welcome to the new ShakespeareGeek.com. My apologies if some stuff broke while I get my house in order and start unpacking the boxes. I hope you all like the new place! Love the new look, many thanks! Congratulations on the new digs, Duane! O how full of briars is this working-day world!